These are some more watercolor techniques (or "water color techniques") that you can add to your repertoire. Watercolor paint should be applied at a darker orstronger intensity than oil paint, because it dries lighter. This is particularly true when working outdoors on abright, sunny day. A direct manner and a full brush are necessary to achieve the luminosity that is so important in a watercolor. You should always mix more of a color wash than you think you will need. The paper is important in creating the sparkling effect that typifies water-color painting. Combining a line drawing with watercolor is another watercolor technique that you can use to achieve pleasing effects. The most popular approach is to outline the subject with black India ink . In this watercolor technique you can use a pen or a brush, but with the latter you will more easily obtain a flexible and varying line. Do not make a hard, detailed ink rendering of the subject. Instead, attempt to have a "lost-and-found" line with occasional heavier accents. Using a pointed brush instead of a pen will help to avoid giving the rendering a stiff, rigid look and will enable you to obtain either a thick or a thin line. When the ink is dry, you begin to paint as you would when doing a regular water color. Sparkling effects are achieved by not slavishly filling in the inked outline but by applying the color freely, missing the outline at times and overlapping the lines occasionally. The inked drawing will keep the subject recognizable at all times. A preliminary line drawing is especially helpful for architectural subjects. Then a tighter rendering can be made to insure that all of the necessary details are depicted. When doing such a subject, it is a good idea to use a pen. Different-colored inks can be used for experimenting with this technique. 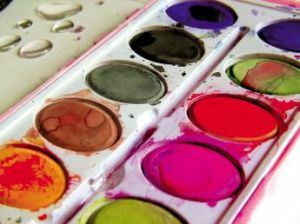 They may not be absolutely waterproof, but occasional blurring or running of the line can add charm to the water color. A sepia-colored ink is often more harmonious than black, and you might mix black and red ink to obtain an interesting-colored outline. A watercolor that has turned out to be unsuccessful because of a weak over-all effect can often be salvaged by line work. The weak areas are generally caused by faulty values, which result in their being lost in the picture. By outlining the entire painting the over-all effect is immediately strengthened. Experiment with your discarded water colors you will be surprised how many can be made at least presentable.